Riding the subways in New York is always an adventure thanks to the surprise serenades by starving musicians and break dancers looking to make a few extra dollars. But there’s also the threat of unpleasant moments like an unruly passenger wielding a sharp object or a man masturbating in public for 30 minutes. 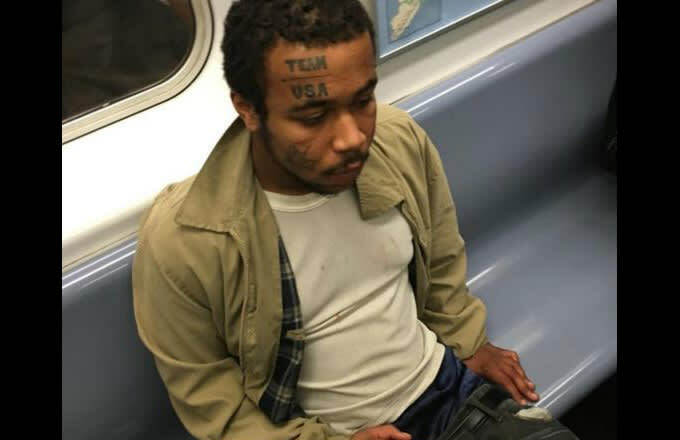 According to Jezebel, police are looking for a man with “Team USA” tattooed on his face after he masturbated for a half hour on a train heading into Manhattan on Sunday afternoon. “The man, who can be seen in a photo released by police, had his hands in his pants while staring at a 29-year-old woman who was also aboard the train about 4 p.m., NYPD officials said,” DNAinfo reports. The woman snapped a photo of the man before reporting him to authorities. Police have since Tweeted the picture, saying it shouldn’t be too hard to find him. Well, what could possibly set him apart from other people?